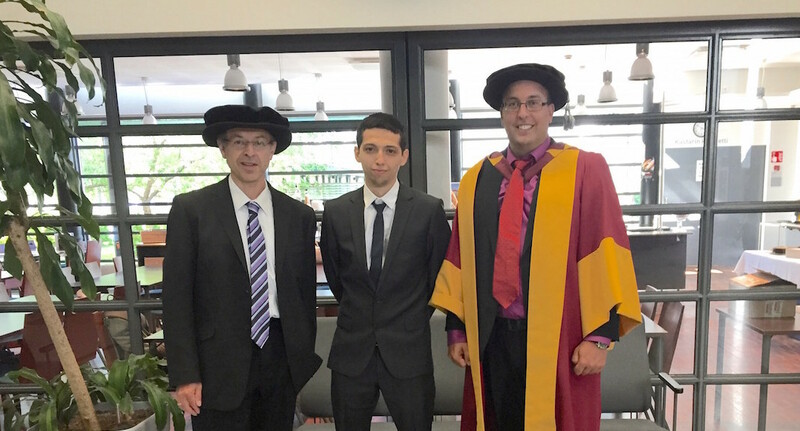 Home » News » Jorge Goncalves defends PhD! Congratulations to Jorge Goncalves who defended his PhD on August 14, 2015. His opponent was Albrecht Schmidt (University of Stuttgart) and his pre-examiners Niki Kittur (Carnegie Mellon University) and Panos Ipeirotis (New York University). Jorge’s thesis was entitled Situated Crowdsourcing: Feasibility, Performance and Behaviours. You can read more about his thesis in this post. Photo: Taken shortly after Jorge’s defense with his opponent. From left: Albrecht Schmidt, Jorge Goncalves, Vassilis Kostakos.